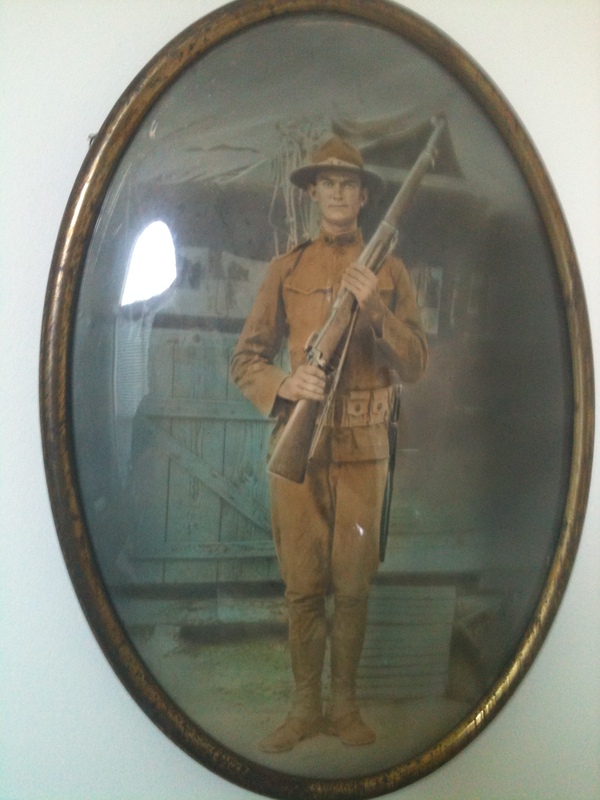 My grandfather is wearing his World War 1 uniform. This picture is dated 1916. While fighting on the frontlines in World War 1, he got frostbite on his feet. After receiving treatment for frostbite, he walked back to the frontlines. Hence his life legacy, “Never give up.” As I look at his picture, I become inspired. This week, weight loss has been an unsuccessful struggle. Beginning the week, I had a two pound weight loss. Then later in the week, I went to a friends house for supper and had a small dessert. Next morning I gained a pound. Saturday night I had a kid size milkshake with my family. Each one of them had a child size milkshake, so I did too. So Sunday morning I had gained another pound. Sigh. It’s a battle. My senior citizen body wants to keep everything I eat, and I mean everything. Before when God had previously delivered me of 90 pounds, it was easy. All I did was eat three meals a day and cut my food servings in half. I could even have a half dessert and still lose weight. Wow! Felt like it was a miracle. After weighing over 230 most of my adult life and here I was losing weight so easily. Then after three years of maintaining this weight all I backslid and started eating snacks again. Then occasionally I’d eat whole portions instead of half. This resulted in a 30 pound weight gain which has stayed with me for almost two years now. But I’m not giving up on my weight loss goal. You hear me, I’m not giving up! God has been speaking to my heart this whole time. He’s so patient and loving with me. Yes, He convicted me when I overate. But He also let me know I was loved no matter what. Isn’t that wonderful! With God’s help we can win all our battles. After all, God loves you and He’s on your side. Right Now Jesus is before God interceding for both your victory and mine. You are a winner because God is on your side. So never give up, never. Look to Jesus with eyes of hope. He will deliver both you and I. He died to save us, even from our own selves. So be encouraged, Jesus is on your side. He is pulling for you. He wants your victory. You can trust Him. Child, you are in a battle, but you will win for I am on your side. I am your victory and you will win. Today, if you’d like to donate to a worthy cause, please consider one of these causes, https://preborn.org or https://www.indiapartners.org/ . Preborn.org provides free ultrasounds for women considering an abortion. Then hopefully after the mother sees her unborn child in the womb, she’ll choose ‘life’ for that baby. So please consider making a donation for the unborn. India Partners.org is a Christian agency that helps people in India with education, vocation training, disaster relief and medical/health issues. But what touches my heart the most is their work to provide a safe place for children of women who work in the red districts of India. Furthermore, please know that I DO NOT receive any compensation or commission for advertising these organizations. However they are causes that touch my heart. All contributions go directly to these organizations. As a matter of fact, I will not even know if or when you do make a donation. Click on either or both of these link for more information or to make a donation https://preborn.org or https://www.indiapartners.org/. First of all, you know I have to recommend the book I wrote with God’s help. During early morning hours, I’d talk with God about my weight/food issues and that’s what the book is about. After all, He was my weight loss counselor and He still is today. I highly recommend talking to God to everyone who struggles with weight or any other issues. Of course, He’ll listen to you. So talk to Him about anything on your heart. After all, God answers prayers. Also, I’d like to share with you several books written by a personal friend of mine. She writes Christian love stories which include mystery and murder. In addition, she included my idea as how to get rid of the body of the villain. So naturally I like her books. but it does help that she encourages me to write again. I think you may be able to read them via Kindle for free now. You’ll have to check it out. Also, just so you know, she is not paying me to mention her books on this blog. In fact she doesn’t even know about it. But I do receive a small commission from anything you order from Amazon through this blog. So thank you for helping to provide for the expense of maintaining this blog through your orders from Amazon. This is my favorite book written by my friend. In fact, I cried the entire time I read it. It was her first book. I hear you. I feel I am eating so little but my weight is shooting up. Two days ago I watched a video on Adrenal Fatigue. I had all the symptoms mentioned. Eating frequently makes one get insulin resistance and then stuck weight. I am trying to eat once a day or only within a small open space of time- about 2-3 hours. Fasting does make you lose hunger. In a day, I lost 6 kilos. I am now 90 kgs. How is this possible ? I know you believe God will help you conquer cravings and weight. But sometimes God also sends an angel to help you along the way. Just watch the video for my sake and see if the advice applies to you. Wow! Congratulations on that weight loss! I watched the video link. Thank you for sharing this. This just backs up God telling me to only eat three meals, no snacking. Now I’m trying for two meals. Guess that’s semi-fasting, right. Also long ago, God instructed me to go walking. Sadly with all good things, we start well and stop too. Your video link impressed me to start walking again. Also, Potassium, I’m just beginning to learn i need more of it. Thank you so much for sharing this Suzy. I’m going to share this info with my husband too. Also eat more fats during meals- even more butter, preferably they say- grassfed butter- someone mentioned Kerry something Irish butter. Sometimes in the morning I crave a cup of black tea with sugar loaded- its the sugar craving that’s pulling me towards it- I know- I have been resisting it for about 4 days now. And if a sugar craving hits, I eat a spoonful of butter which tastes yuck but I just do it. I am addicted to sugar so its better to get a revulsion to it. thanks for the advice. Eating butter sounds yuck, but I do love butter on my food. I’ll have to watch your video link later. Thank you again for trying to encourage me.You are a great friend. Yes Debbie, you can eat butter on all your food or cook in lard or butter, if you like to keep you from eating sweets- it seems to be working for me.